Houses – for example – that are only two or three stories high, demolition is a rather simple process. The buildings are pulled down either manually or mechanically using large hydraulic equipment: elevated work platforms, cranes, excavators or bulldozers. In taller structures, high-reach excavators or wrecking balls can be utilised. 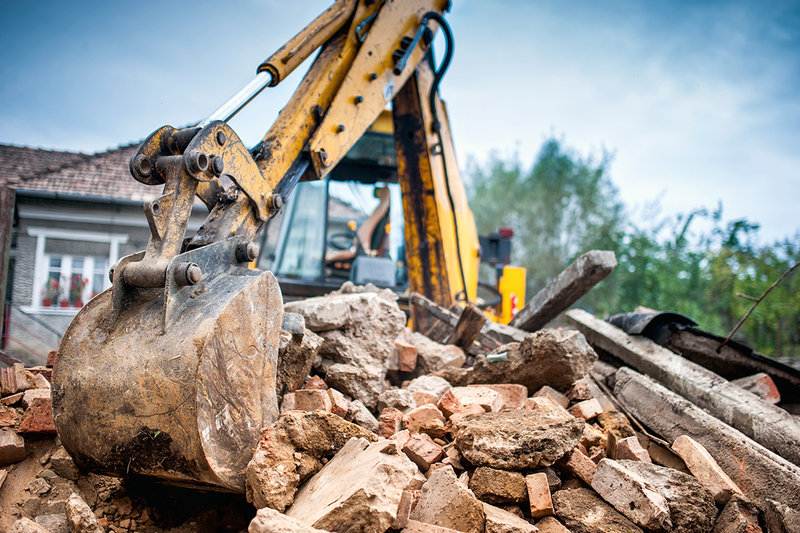 Before any demolition activities can take place, there are many steps that must be carries out beforehand. Health and safety of the public and our employees is of paramount importance, so we are committed to achieve and maintain a high standard. Therefore, our work is carried out in accordance with the current Legislative Act. All our employees are trained to contribute to a work environment which is 100% free of accident and ill health. The site is subject to regular site safety checks by our own in house safety officer. Our company and employees will ensure, so far as is reasonably practicable, a safe place and systems of work, provision of safe plant and machinery, the safe handling of material and the provision of adequate safety equipment (PPE). We also ensure that adequate information, instruction, training and supervision are given to all our employees so that we can perform our duties safely for all. If you have any questions or inquiries, don’t hesitate to contact us! We would be happy to assist you. where sensitivity to the surrounding environment is paramount.